Boat seats are designed to withstand the environmental conditions they encounter. Manufacturers use marine grade vinyl to cover seats because it’s known for its strength and ability to stand up to grime. In contrast with most other man-made fabrics, vinyl is highly resistant to moisture and humidity, which is why it’s become the industry standard for marine applications. But there’s only so much that vinyl can take without breaking down. If you aren’t giving your boat seats regular care, they’ll accumulate dirt and mildew that damages them over time. If you want to protect your investment for the long-term, you’ll need to clean your seats periodically and guard them against harmful UV rays from the sun. In this guide, we’ll share a complete set of tips to clean and protect your boat seats, so you won’t have to deal with the damage that comes from neglecting your seats. If you follow these tips, you’ll be able to enjoy your boat’s seating to the fullest! Not all vinyl is created equal. There are different “grades” of vinyl, which are designed for varying purposes and have different characteristics. 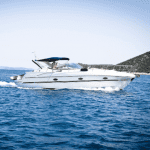 Marine grade vinyl is intended for applications in the conditions that a boat will encounter when it’s in use. Within the marine grade category, there are a few different types of vinyl. Some are designed to look perforated or like fabric. It’s a good idea to check with the manufacturer to see if there are any special considerations if you have something other than the standard marine-grade vinyl. To extend the life of your seats and keep them looking fresh, you’ll want to create a regular schedule for cleaning. If you get into the habit, you won’t forget what you need to do when. How often you clean will depend on how often you use your boat and how dirty it gets while you’re out. If you notice any visible grime, it’s time to scrub! If you make routine maintenance a part of your regular boating experience, you’ll prevent much of the build-up that results from going too long in between cleanings. After you return from each boating trip, simply wipe down your seats. You’ll also want to clean up any spills as soon as they happen. Vinyl does contain pores, and it can stain if messes aren’t wiped up immediately. It’s smart to keep cleaning supplies onboard, so you’re prepared for the inevitable. Tree sap is especially notorious for causing damage to boat seats when the boat is parked. Once the sap gets on the seats, the sun bakes the sap in, making it extremely difficult to remove. So if any sap gets on your seats, clean them immediately. Be sure to use a boat cover whenever you’re not using the boat, to protect against tree sap. When you’re ready to do your periodic cleaning, collect all the supplies you’ll need before you begin to streamline the process. Gather your vacuum, several clean cloths, a soft brush, a good-quality cleaner that’s designed for marine-grade vinyl, and an old toothbrush. Before you introduce cleaners, it’s a good idea to vacuum up any loose dust and dirt particles that may have accumulated. Don’t forget to vacuum under seat covers, between joints, and in crevices. Work in sections, one seat or section of seats at a time, to prevent the cleaner from drying out on the surface. Spray your cleaner onto the seat and allow it to sit for a minute or so. Use a clean, damp cloth to wipe away the grime as it loosens from the surface. If you have trouble getting down into the creases, use an old toothbrush. Wet and wring out another cloth and go over the surface again to remove any remaining traces of cleaner. Wipe the surface dry with a clean towel, taking special care to wipe up any standing water in the cracks. These steps should take care of standard cleaning needs. If you have stains or a mildew problem to deal with, keep reading! Stains, whether from accumulated grime or from mildew, often won’t come out with standard cleaners. They require special treatment. For stains that have developed over time, try a Magic Eraser. Simply wet one of the pads and gently scrub your seat surface. You’ll be surprised just how effective these little sponges are. When you’re done, wipe the area with a clean, damp cloth. Clean one seat or section at a time to keep the cleaner from drying out. Spray the mildew stain remover onto the stain and allow it to sit for about a minute. Gently brush the stain with circular motions. Wipe the surface with a clean, damp cloth to remove any remaining traces of cleaner. Dry the surface with a clean towel. At this point, your seats should look much better! While not every stain will come out (Sharpie ink, for example, is impossible to remove), you should see a significant improvement. Start with a clean, dry surface. Spray the product onto a clean microfiber cloth. Using gentle, circular motions, rub the product into the vinyl. Then, with another clean cloth, buff any excess product. Because the product will gradually wear off, you’ll need to clean and re-apply the UV protectant every month or so, depending on how often you take your boat out. No matter how careful you are, accidents happen. A tool aboard your boat may fall and tear a seat. Or a fishing hook may catch on a seat. There are myriad ways that seat covers can get damaged. Purchase a quality vinyl repair kit that includes a base compound the color of your seats. The kit will contain a special applicator. Apply the repair compound with the applicator and then spread it over the damaged area with a plastic knife. Gently smooth the repair with 600-grit sandpaper. If your repair kit doesn’t come with a base compound in the color of your seats, you can use a spray paint specifically designed for vinyl to match the original color. Finish by applying a coat of vinyl conditioner. Be sure to use a repair kit that’s specifically made for marine vinyl. You can also get replacement boat seat vinyl by the yard, or have your seat professionally repaired if you aren’t comfortable trying it yourself. If your seats are significantly damaged, especially if mold has taken up residence inside, you may need to replace your boat seats. When your boat is parked or in storage, you can easily protect your seats by using boat seat covers. These covers not only keep the sun off your seats, they also prevent dust and bird droppings from damaging them. Look for breathable boat seat covers to prevent moisture accumulation that can result in mildew problems. Also make sure your covers are made from material that blocks harmful UV rays. As with any investment, it’s best to care for and protect your boat seats consistently. It’s much easier to prevent damage than to rectify it. Just like you regularly wash your skin and apply sunscreen to your skin before heading out in the sun (you do, don’t you? ), you’ll want to regularly wash and apply UV protectant to your boat seats. By caring for your vinyl, you’ll enjoy being out on the water even more, knowing that you can look forward to many more excursions in the future! Previous: Sea-Doo vs. Yamaha vs. Kawasaki — Which PWC Is Best?